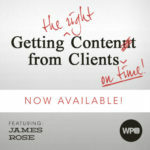 James Rose is a co-founder of Content Snare and hosts the Agency Highway podcast. He has a passion for helping web designers and digital agencies do less work, get better clients and reduce their stress levels. This developed after several years of stressing too much in his agency. James’ favorite topics are systems, processes and automation because he thinks these are the best ways to set a business up to grow and to work less at the same time.